*اویونلارین و قوْل‌لارین سایی‌سی تکجه داخلی لیگ اساسیندادیر آمار بوتاریخده یئنیله نیبدیر 20:20, 29 December 2018 (UTC). 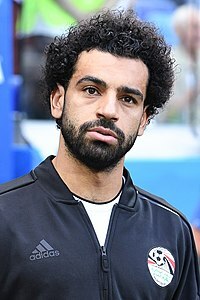 محمد صلاح (اینگیلیسجه: Mohamed Salah) (دوْغوم:۱۵ ژوئن ۱۹۹۲(1992-06-15) ‏(۲۶ یاش) میصر) بیر فوتبالیست. لیورپول فوتبال کولوبو و میصر میلّی تیمی ترکیبینده چیخیش ائدیب و هوجومچو موقعیتینده اوْیناییب. فیفا دونیا کاپی ۲۰۱۸ اوْیونلاریندا مئیدانا گئدیب. ↑ Egypt (PDF). AllAfrica.com. یوْخلانیلیب20 December 2018. ↑ محمد صلاح. Barry Hugman's Footballers. یوْخلانیلیب1 May 2018. ↑ Ashraf Abdul Hamid (9 October 2017). "The journey of Mohammed Salah from the village of "Najrig" to the World Cup in Russia (translation)" (in Arabic). Al Arabiya. Retrieved 9 October 2017. ↑ 2018 FIFA World Cup Russia: List of players: Egypt (PDF). FIFA (17 June 2018). ↑ ۵٫۰ ۵٫۱ Abdel Fattah Faraj; Asharq Al-Awsat (4 March 2018). "The inspiring story of Egypt and Liverpool superstar Mohamed Salah". Arab News. Retrieved 29 August 2018. ↑ "Guinea 2–3 Egypt: Aboutrika brace and Salah’s last-gasp winner power Pharaohs in Conakry". Goal.com. 10 June 2012. Retrieved 27 July 2016. ↑ Amy Lawrence (19 June 2018). "Russia all but qualify for knockout stage with win over Mo Salah’s Egypt". The Guardian. Retrieved 18 February 2019. ↑ Luke McBride (8 September 2018). "Aguirre’s first game ends in Egypt beating Niger 6-0 in AFCON qualifier". KingFut. Retrieved 18 February 2019. قارداش پروژه‌لرده محمد صلاح گؤره داها آرتیق بیلگی‌لر تاپابیلرسینیز. بۇ صفحه‌‌ سوْن دفعه ‏۲۳ فوریه ۲۰۱۹، ‏۲۳:۲۴ تاریخینده دَییشدیریلمیشدیر.